PHOTO: Allen Ramsey, DWCPhoto.com. The Highlands Ladybirds cross country team finished state runner-up in the Class 2A cross country meet Saturday at Kentucky Horse Park in Lexington. 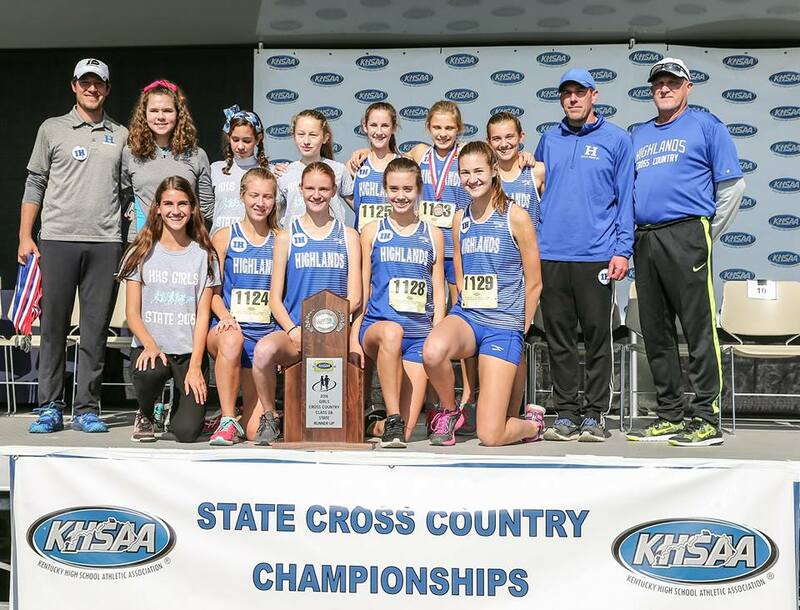 The Highlands Ladybirds cross country team fell short in its bid to five-peat as Class 2A state champions Saturday at Horse Cave Park in Lexington. Highlands scored 93 points, but the Christian Academy of Louisville Lady Centurions placed three runners in the top 10 out of 207 runners on their way to 64 points. The Ladybirds had won 2A the previous four years and own 10 state championships in school history. "Our team ran really well," said Brian Alessandro, Highlands Head Coach. "Any other year, we probably would have won. CAL had some really strong runners up top and their fourth and fifth runners ran well. Even last year's team wouldn't have beaten them (Saturday). We ran just as well as we have in the past. It just wasn't good enough." Ladybird eighth grader Maggie Schroeder took fifth overall and scored four points for Highlands in 19 minutes, 23.24 seconds in the five-kilometer race. Places of individual runners that qualified for the state meet are not counted toward team totals. Lexington Catholic senior Michaela Reinhart won the race in 17:57.18. "I had a really, really good race," Schroeder said. "I felt really strong the whole time. But I knew about halfway through the race I could (finish in the top five). I just really wanted to start passing people and get up there." Highlands junior Brianna Collins took 21st in 20:26.44 scoring 18 points, but four CAL runners crossed the line by that point. Junior Karsen Hunter and eighth grader Greta Noble followed in 26th and 27th respectively in 20:33.52 and 20:34.34 scoring 22 and 23 points. Then freshman Alissa Campbell crossed the line in 30th in 20:38.56 scoring 26 points. Juniors Ashtyn Heiert and Savannah Brady were the non-scoring Highlands runners. Heiert finished 46th in 21:21.59 and Brady finished 68th in 21:44.95. The Bluebirds finished seventh in the state cross country meet a year after finishing state runner-up in Class 2A with 263 points. Highlands eighth grader Will Griffith led Highlands placing 35th in 17 minutes, 41.65 seconds. "We'd been running not up to our potential all year," Alessandro said. "They stepped up huge (Saturday) getting seventh by almost a minute faster than what we'd been running. They just ran really well. They were led by an eighth grader. When you have an eighth grade boy who runs that well, that usually doesn't happen." Seniors Colt Parris and Kevin Kreutzer were not far behind finishing 41st and 42nd in 17:45.79 and 17:47.08 respectively for the Bluebirds. In terms of team points, Griffith scored 33 with Parris and Kreutzer scoring 38 and 39 respectively. But the Bluebirds did not see another runner cross the finish line for another 45 seconds as junior Anthony Derosa took 91st in 18:36.88 and junior Caleb Chambers finished 94th in 18:38.86 to round out the Bluebird scoring. Derosa and Chambers scored 75 and 78 for Highlands. Sophomores Donovan Staab and Jake Ryan also ran in the meet for Highlands. Staab finished 116th out of 230 runners in 18:49.98 and Ryan finished 178th in 19:51.18. Lexington Catholic won the meet with 73 points and North Oldham finished second with 86 after winning it last year. Warren East junior Jacob England won the meet in 16:05.08.